Auriga has developed partnerships with some of the most renowned academic institutions and is a member of the main international associations in the industry. It upholds an important commitment to act as a leading player in the improvement of the market culture, definition of the most innovative standards of quality of products and research and enhancement of new resources and competences. ATM Industry Association, the reference association for the industry at an international level, which today includes over 2200 members in 60 countries. Although the CEN ISSS/XFS is a standardization entity, the set of rules and specifications are mandatory in order to be able to run in a real ATM Multivendor environment. WWS Client (the Smart Client application on the ATM) is fully compliant with all specifications of CEN ISSS/XFS starting from version 3.0.. Additionally Auriga is a core member of the WorkShop CEN ISSS/XFS, assuring Customers the compliance of products to this standard and promoting all actions required to answer the customers’ needs. The EBA acts as a hub and network of EU and national bodies safeguarding public values such as the stability of the financial system, the transparency of markets and financial products and the protection of depositors and investors. Auriga is an Associate Member of nexo, an international non-profit association founded by key industry players. The mission of nexo is to promote the widespread acceptance of the nexo protocols, a series of standards to ensure interoperability between card acceptance and acquiring solutions, integrated retail and terminal management systems. Auriga is partner of Cabel I.P. the first company operating in its field having a banking ownership. It was constituted according to the Payment European Directive (PSD) and has been operating since 2011. It offers payment services to companies, families and public administration offices, directly and through associate banks. Auriga is part of the Distretto Produttivo dell’Informatica (District of Information Technology Production), a network of IT businesses recognised by Regione Puglia, whose purpose is the development and promotion of member companies who believe in the digital economy and its ability to innovate the processes of social transformation and interaction. 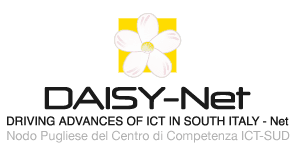 In 2010 Auriga signed up to participate in the share capital of Daisy Net S.c.a.r.l., a company that is a non-profit consortium whose mission is to enhance the value of skills, expertise and experience developed by research centres and universities in Pugliain the field of ICT.